Following is overall sequence diagram of ePDG Discovery and IKE procedure. This is the case where WiFi AP and UE WiFi module is based on IPv4 (It doesn't matter whether UE is using IPv4 or IPv6 for application layer in this diagram). I will post another section later for the case when UE and AP is using IPv6). Actually the only difference is whether they use DHCP or DHCPv6, but there would be something I need to add in detail for IPv6 case). (1.a) and (1.b) belongs to 802.11 protocol. Details of this step is out of the scope of this page. 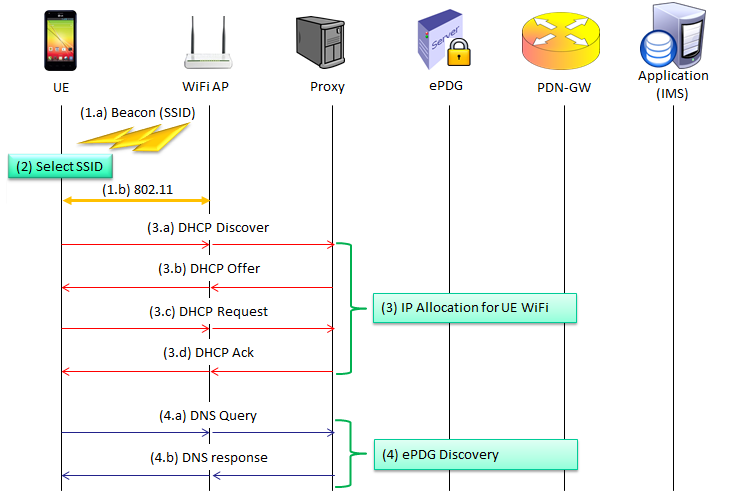 If you want to know the details of this step, refer to step (1)~(7) in WLAN Protocol page. Once UE (WiFi device) decode Beacon, it will show all the SSID it detected. Then you can select a specific SSID manually or the device automatically select the SSID in a certain order you have configured. Refer to ePDG Discovery Page for the details. This is very long/complicated process and described in a separate page. Refer to Overall Sequence Flow - 3GPP 33.402 of IKE page. Actually this is not an independen procedure. This is a part of IKEv2 procedure and described in detail in CSCF Descovery page.